Well if you are looking to knock out one more fan on your HTPC this might just be the card you are looking for! ASUS has put together a well performing AMD Radeon HD 5500 engine with cooler running 1Gb DDR2 memory and look Mom … no “fans” (ouch that hurt). The first thing you notice on the card is the massive heat sync, it really looks like it can displace a massive amount of heat. Now I say massive but it does stay within the confounds of a standard two slot PCI Express x16 card and will not interfere with anything else next to it. Measuring in at just over 5 in. wide and just under 4.5 in. tall which should fit in most HTPC cases that support full height cards. 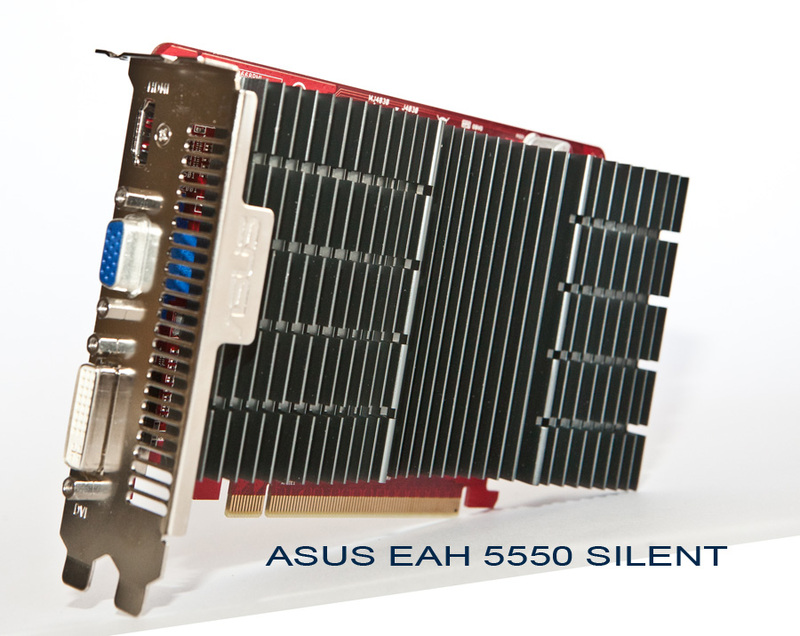 The EAH5550 does not require any additional power connections from the power supply, it is simply plug and play. Install was quite easy, just un-box and snap it into an available x16 pci-e card slot and you are good to go. Drivers are available for Windows XP (32/64 bit), Vista (32/64 bit) and Windows 7 (32/64 bit). Also included is a bundle of software that helps you manage your new card. 1. VGA card information and running status for GPU temperature, and so on. 2. Overclocking feature where you can set clock and memory frequencies on the fly. 3. GPU temperature detection and monitoring, it will let you know if things start to heat up. Available for Windows 7 or Windows Vista 32/64-bit Edition. Provides features such as GameFace Live, GameLive Show, HyperDrive, OnScreenDisplay, SmartDoctor, Splendid & VideoSecurity Online... If you wish to run these ASUS special features, you have to install the ASUS Driver (not AMD) first and then install "ASUS GamerOSD". 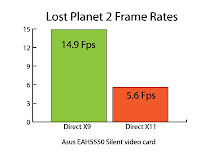 Well if you are after a silent video card upgrade with Blu-ray playback capability for you HTPC this would be the way to go. 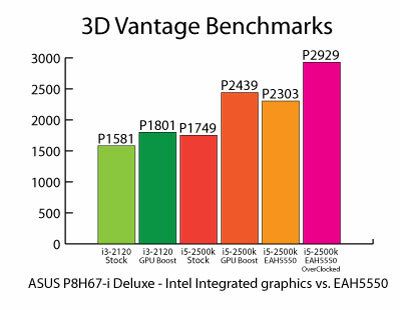 As you can see from the performance benchmarks it is not much of a gaming card but nothing is in this price range. It will still run some of the more popular games but don’t expect to have the graphics set to maximum quality. 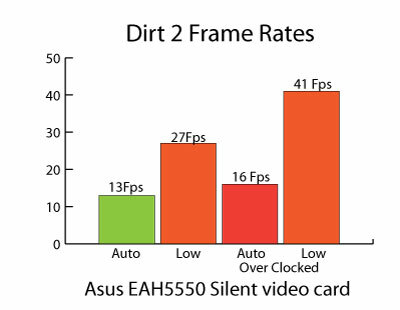 I played Dirt 2 just fine as well as Lost Planet 2 but I had to opt for lower graphics quality. 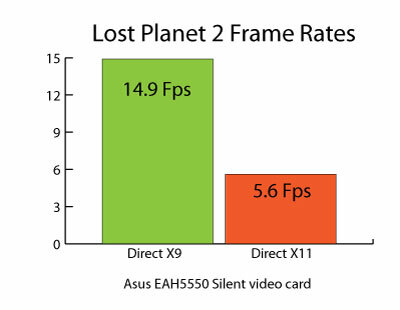 All that aside it performs perfectly when playing streaming video, DVD and Blu-ray play back. It also performed well in photo and video apps including Adobe Photoshop and Premiere. It will support the biggest panel you can hook up to it at a max resolution of 2560x1600. 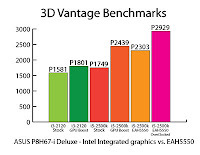 Keep in mind If you have an i5 or i7 sandy bridge processor this does not offer much improvement but if you have an older box you are looking to upgrade this is your ticket. 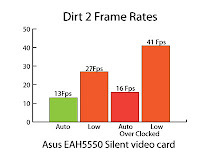 If you are looking for a low priced video card, with good performance, the Asus EAH5550 should be on your short list. 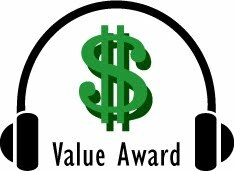 Based on it’s quality, performance, and price, it has earned our Value Award. 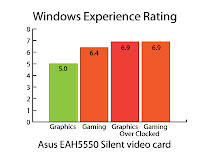 For more info and complete specs, check it out at www.asus.com.